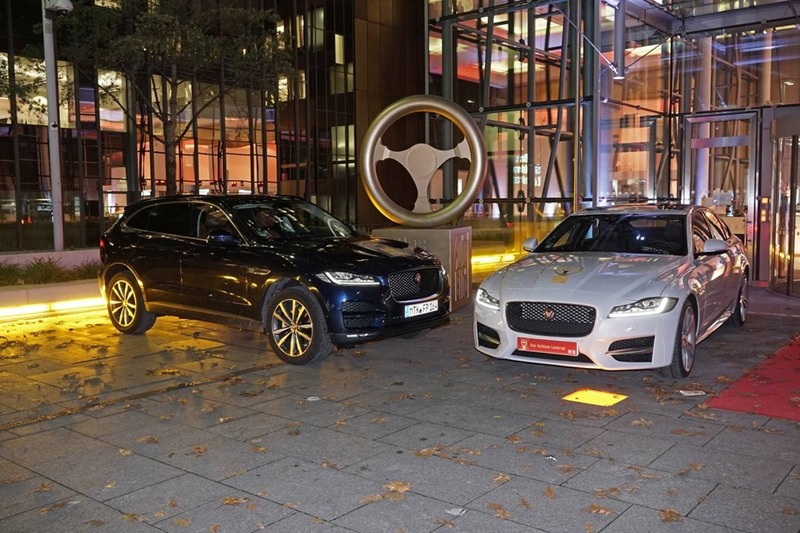 Berlin, 9 November 2016 – Jaguar has won Germany’s top car award, the Golden Steering Wheel. The Jaguar XF was voted ‘Best Saloon’ in the Mid-Full-size category, ahead of the Mercedes-Benz E-Class and Volvo S90. Jagua r had further reason to celebrate in the Large SUV category, with the F-PACE taking second place. The Jaguar XF defines the segment with unrivalled design, luxury, technology and efficiency, underpinned by class-leading driving dynamics and refinement. With the recent addition of all-wheel drive, the XF offers greater confidence in its all-weather traction and has exceptional total cost of ownership, with class-leading residual values and running costs. “Winning this prestigious Golden Steering Wheel award in the most demanding automotive market and the toughest premium segment in the world, means a lot to Jaguar Land Rover. The Golden Steering wheel confirms all the efforts of the Jaguar Land Rover team in delivering special, solid products with distinct character that excite the senses. Jaguar’s first performance SUV, the F-PACE, took a strong second place in the large SUV category. It is designed and engineered to offer the agility, responsiveness and refinement Jaguar is renowned for together with everyday usability that delivers the Ultimate Practical Sports car. The F-PACE has been fantastically received and is Jaguar’s fastest-selling vehicle ever. For the 41st Golden Steering Wheel Awards, 36 new models competed in six categories. In the first round of voting, millions of readers of Auto Bild and its sister publications in more than 20 European countries, together with the readers of Sunday paper Bild am Sonntag, selected their favourites. After the votes had been counted, the 24 finalists were determined. A 67 strong jury consisting of racing drivers, chief editors, designers and other car experts, thoroughly tested the new models comparing driving dynamics, connectivity, designs and operating costs. Launched earlier this year, the second generation of the Jaguar XF is available with a variety of powertrains, including two 6-cylinder engines and several variants of the new 4-cylinder Ingenium diesel engine. The choice of powertrains ranges from the 2.0-litre diesel with 132kW and CO2 emissions of 114g/km, to the 3.0-litre 6-cylinder petrol variant with 280kW with a top speed of 250kph. Jaguar’s first performance SUV, the F-PACE went on sale in April this year and has already become the fastest-selling Jaguar ever, achieving global sales success and receiving numerous global awards. It offers six powertrains, from the 4-cylinder 2.0-litre Ingenium diesel with 139g/km efficiency producing 132kW/430Nm, to the 3.0-litre 280kW supercharged petrol V6 engine taken from the F-TYPE.